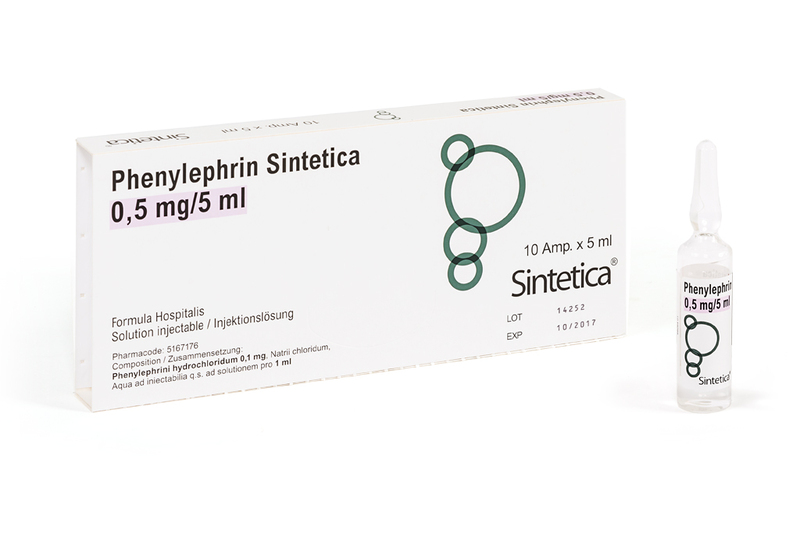 Phenylephrine HCl is a fast acting highly selective α1- receptor agonist with a short half-life, widely used by anaesthesiologists and intensive care specialists in the treatment of hypotension in the intensive care unit, operating and obstetric ward setting. Phenylephrine is the standard drug to rapidly treat hypotension due to peripheral vasodilation caused by general, epidural and spinal anaesthesia (caesarian section). Hypotension induced by drugs, especially during induction of general anaesthesia and other intraoperative circulatory problems, responds rapidly to Phenylephrine. Phenylephrine Sintetica is a preservative and sulphite free solution. The ready to use formulation (0,5mg/5ml), without further dilution by the end user, responds to safety efforts and to modern trends in drug application.